Apostrophe Catastrophes: What the Dickens?! It was the best of times. It was the worst of times. No, actually, it was definitely the worst of times for whoever made this sign for the John Harvard Library in London. Thanks to Helen for submitting this atrocity. Oh wow! I saw someone on G+ the other day whose last name was Williams...spelled William's. Really? 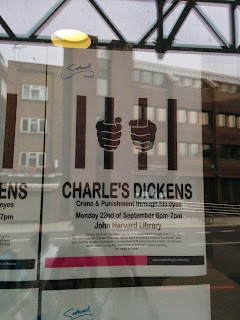 This one sent my wife's mind reeling in an unusual (for her) direction - she said it would have been improved had they sign-maker dropped the ens from Dickens as well. Also why to folks add an s to names like Keith Richard, who got so tired of correcting the error he permanently changed his name to Keith Richards? At least, my wife said, (now on a roll) it wasn't to Keith's Richard.
. In the relatively recent past, liquidating checks implied anguishing long queues in banks, just to find that your check couldn't be gotten the money for when you achieve the teller. Happy Belated National Punctuation Day!